Dabur Rheumatil Tablets for Gout, Arthralgia, Osteoarthritis, Frozen Shoulder, Cervical and Lumbar Spondylosis, Joint pain and Muscular Pain. Dabur - General Health Products - Worldwide Shipping. 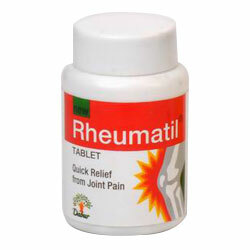 Rheumatil tablet is a potent herbal combination of Anti-arthritic, Anti-inflammatory as well as Disease Modifying Anti Rheumatic drugs and has been found very effective in all arthritic problems. Traumatic inflammatory conditions e.g. fibrositis, Bursitis, Capsulitis, Tendinitis, Synovitis, Sciatica and Sports injuries. Guggulu: Natural steroids (Guggulosterones) present in Guggulu exert potent anti-inflammatory reaction. Guggulu also contains Myrrhanol, which is responsible for its analgesic action. Salai Guggul: Blocks all four channels of pain (Prostaglandin, Bradykinin, Histamine, Leukotriene). Boswelia is non-ulcerogenic, non-hepatotoxic and cures leaky gut proving its DMARD activity as well. Prasarini: inhibits the elevation of serum orosomucoid levels suggesting the possibility of DMARD activity. Rasna: Studies show that Rasna increases the neutrophil activity on phagocytes besides being a potent anti-inflammatory agent. This shows a significant DMARD activity of Rasna. Nirgundi: Studies have shown Vitex negundo as a potent prostaglandin inhibitor. Since there was no gastric irritation observed in the clinical trials a possible Cox 2-inhibition theory is also given for its anti-inflammatory effect. Two tablets 2-3 times a day. Nirgundi (Vitex negundo) - 62.5 mg.